The DeWalt 20V MAX Li-Ion Reciprocating Saw Kit is ideal for a variety of cutting applications. Designed with a four-position blade clamp that allows for flush cutting and increased positional versatility with tool-free blade changes, this saw is both flexible and powerful. It also provides a 1 1/8-inch stroke length that delivers a fast and consistent cutting speed, so that your projects get done quickly and correctly. The M18 FUEL SAWZALL Reciprocating Saw cuts faster than its corded counterparts and offers up to 2x more runtime and 5x longer tool life than competitive saws. The POWERSTATE brushless motor provides cutting power that has only been associated with corded tools. The saws REDLINK PLUS Intelligence ensures optimized performance and protection from overloading, overheating and over-discharging. The 18-volt lithium-ion SAWZALL features an adjustable shoe, integrated LED light, and a hang hook for convenient storage on the job. 20V MAX Li-Ion Reciprocating Saw with 1 Battery and Kit Box The DeWalt 20V MAX Li-Ion Reciprocating Saw Kit is ideal for a variety of cutting applications. Designed with a four-position blade clamp that allows for flush cutting and increased positional versatility with tool-free blade changes, this saw is both flexible and powerful. It also provides a 1 1/8-inch stroke length that delivers a fast and consistent cutting speed, so that your projects get done quickly and correctly. 20V MAX Li-Ion Reciprocating Saw with 1 Battery and Kit Box is rated 4.7 out of 5 by 31. Rated 5 out of 5 by bowtieguy60 from Great 20V saw. It is a great addition to my... Great 20V saw. 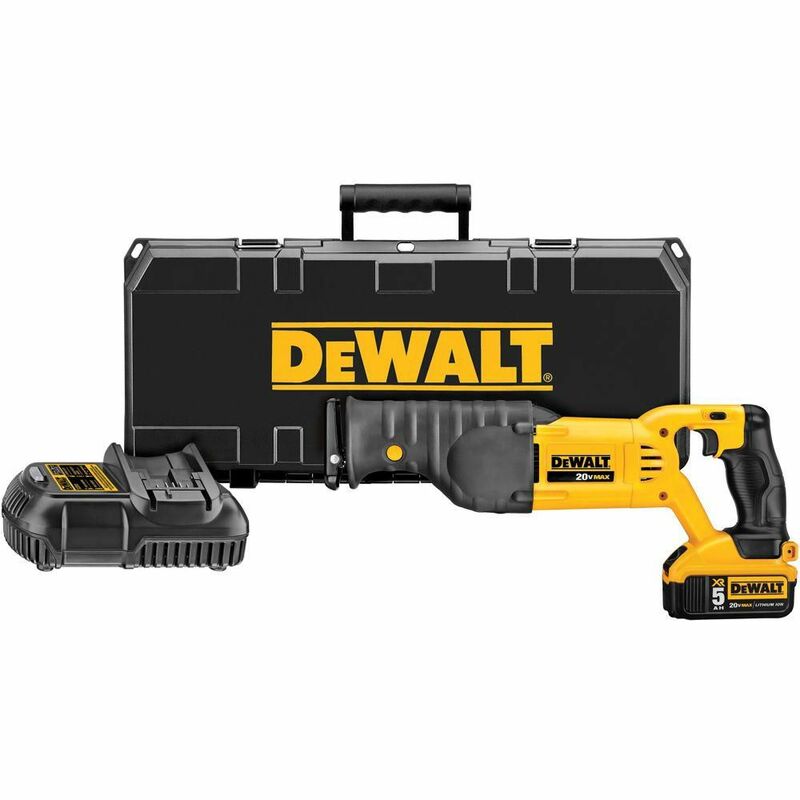 It is a great addition to my other DeWalt 20V tools! Rated 5 out of 5 by Unanimous from Ordered pickup from the online webpage and was a very... Ordered pickup from the online webpage and was a very easy process with little to no time spend in the store. Tool works great as expected. Rated 5 out of 5 by Mike from I find it to be good on my homé improvement... I find it to be good on my homé improvement jobs. Rated 3 out of 5 by RinSnohomish from Nowhere in the information about the product could I find anything saying that the saw did NOT co... Nowhere in the information about the product could I find anything saying that the saw did NOT come with at least one blade. Why would they not include a simple blade in a product labeled a "reciprocating saw KIT"?